Welcome to bar MERCURIO. We are a quaint Italian restaurant that serves fresh pasta, a fish of the day, classic antipasti, and not - like our artichoke au gratin appitizer. With our salads you will find an anchovy partial cesar salad to a healthy dandelion salad with shaved crotonese cheese. We serve classic pizzas like buffola and prosciutto to "crazy" stuff like pistacchio and fennel sausage. Our gluten free crust is uncompromising. In addition, we are pleased to be able to offer an interesting selection of wines by the glass with our Enomatic dispensing machine. All food was way too salty! Caesar salad too vinegary, as well. Romaine did not seem fresh and crisp enough. You could choke on the artichoke pieces on my pizza which were very tough! The whole wheat crust was burned and hard. Basically, not worth the struggle, and especially not at that expensive a price! Our waiter was nice enough but kind of abandoned us. Disappointed. Tables at the front were too confining and a refrigerator at the back had extremely bright lights that you could escape if you face the front of the restaurant. This is one of my favourite restaurants. The food , bar and most importantly the wonderful staff make it an epic expreiece each and every time. I am a repeat cutomer when I come to Toronto for work or pleasure. Busy when I arrived but greeted and invited to the bar while waiting for my guest. After a few minutes was offered a choice of tables which was very nice and my guest arrived. Menu explained, wine suggested, and order taken by a very pleasant and knowledgeable waiter. Two starters and a shared entree was gracefully accommodated. Food was excellent as was the wine. Topped the meal off with a wonderful dessert. Pleasant evening spent in a room where you could talk. On our leaving the host made a special effort to make sure we were thanked. Fine neighbourhood dining at its best and a great night out! Highly recommend. Third visit and have not been disappointed yet. Absolutely A+ staff; A+ food and great location if you're heading to Koerner Hall! We'll be back! Especially the food and the service were excellent. Noise level a bit high, but to be expected on a Saturday evening. Bar Mercurio never disappoints! Joe and his staff are excellent. Quality products used to make the best meals. We will be back many times. Our experience was exceptional. The waiter, food and atmosphere did not disappoint. Anxious to return. Thank you for an enjoyable evening. The room is inviting, and the service is great! I had the cornish hen which was lovely. Friends had the surprise meal and it wasn't outstanding. Our lunch at Bar Mercurio was wonderful, absolutely divine! The service was exemplary, the atmosphere delightful, and the service was of the very highest standard. We are counting the days before we return!! The food was lovely, the staff courteous and quick and the overall vibe of the place was elegant and peaceful. I love this place and usually have great food and service. My complaint is that it took 25 min before the server came back to take our order, and 3/4 of the selections involved funghi and / or truffles. But they are so nice and helpful and i would definitely go back. Classy, nice ambience, good food, attentive service. We are disappointed the pesto pistachio pizza and the burrata were taken off the menu. From the moment you walk in the door you are greeted by a lovely attentive staff who are clearly happy and passionate about what they do. The ambiance is relaxing and it's a nice touch to have the open view kitchen adding to the experience. I have lived in 4 countries and Italian is my favorite cuisine and let me tell you - best pasta I have ever eaten. I went there 2 days in a row to prove it. Rob our waiter was informative and attentive without being intrusive. Giuseppe the owner clearly knows what he's doing and is an exceptional host. Thank you team for making not only my week special but my mom's first time in Toronto a memorable occasion. Your classic neighbourhood boite. So comfortable in all respects. Ate here before night out at the basketball. My second visit this year and my husbands first visit. Love the service and ambiance here. Food was excellent. Beef ragu is the best I’ve tasted anywhere. Waiter was very helpful with choice of wine to compliment the dish. 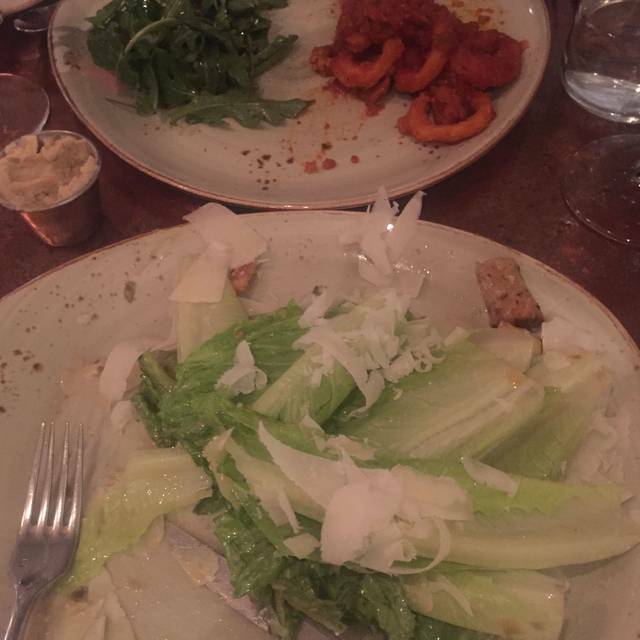 My husband had a Caesar salad and pizza which he said was excellent too. This is our new favourite restaurant in this area of Toronto and we’ll be visiting whenever we’re visiting Toronto from out in the boonies. Many better Italian restaurants. Overpriced for the unimaginative, ordinary fare. Living on reputation alone. I gave the food a 3 star because i found the Ceasar salad too sour but the liver pasta was very good. Our waiter was very good at the beginning but then we never saw him again. Bar Mercurio is always consistent in terms of the quality of the food, the atmosphere, the wine and the service. The staff are friendly and helpful and the owner, Joe Mercurio, remembers every (regular or semi-regular) customer and greets them warmly like they're family. I will continue to go back to Bar Mercurio for special occasions and just everyday dinners and highly recommend the restaurant. We enjoyed our meal a lot. Unfortunately I left my brown fedora hat behind. I hope that I can retrieve it. We will definitely be going back to taste their pepperoni pizza. Great spot / ambience - excellent service. Unfortunately, food was horrible - pizza was tasteless / left Half of it. And for $21. Barely any cheese. Le Pizzaiole - one gourmet slice there for $6 is bigger and tastier..
Caesar salad was miniscule - maybe 8 leaves? Overdressed and $16. Excellent food and service in a Genuine Italian restaurant in the heart of Toronto! Excellent regular and gluten free pizza as well as gluten free deserts(2) ! A great resto ! All other dishes good also as I have been back more than a few times! A neighbourhood favourite. Roberto is a fantastic server. Great food . Because we had a baby with us we were shoved in a corner by the front door on one side and the window behind us. It was very cold and every time the door opened it was a wind storm even with the makeshift drape. The food was mediocre and the service was poor. We reminded the server after dessert was served about the coffee he forgot. Long wait for mediocre food. Will not return or recommend to anyone. Poor Italian food and I’m Italian. First visit and hopefully, not my last. My friend and I had dinner last Friday at this lovely Italian restaurant. I had the Rigatoni Ragu which was absolutely delicious, one of the best I've tasted ever. My friend had the steak which was one of the specials and she also, thoroughly enjoyed her dinner. Steak was cooked perfectly and was served with a medley of mushrooms. Clean plates all around. Good wine menu too. Great atmosphere, good service and not too noisy. Perfect. This is our "go to" neighbourhood restaurant. Great ambiance and warm attentive staff. Always fresh, delicious and authentic modern Italian food. Reservations on time. Service and food was excellent. Chef's choice was great! Got us out in plenty of time for the SoundCrowd Concert. Will be back! Everything was cooked to perfection . Liked the intimacy of the place and warmth of the servers and host. We reserved at Bar Mercurio as it was convenient to our hotel, Kimpton St. George. We were warmly greeted at the door by the owner and seated at a lovely table at the back. The restaurant has such a warm, inviting ambience with beautiful decor. Excellent staff guided us regarding choices for wine,appetizers and main. The tapenade that accompanied fresh bread was delicious with just a bit of spice. Appetizers were excellent! Left me wishing I had ordered more, until my main ( rigatoni) arrived. Perfection! Everyone was very pleased with their choices. Too full for desert which says a lot. Bar Mercurio provided a lovely evening and we will definitely return. An excellent lunch at Mercurio, a small bistro with a simple but excellent menu and impeccable service. What’s not to like? Women tip poorly because the service we get is poor. When will this sink in? When will restaurant owners stop seating us behind a clattering stainless steel fridge? That was just one insult. We were ignored once the food was served. We had to ask for more water. The salad was an abomination; red cabbage leaves with a dash of oil for $18. Excuse me? Yes, $18. The goat cheese was invisible. The last straw was cash set down on the table with a crumpled up invoice. I also caught a glimpse of the kitchen on my way to the coat cupboard. It was awfully filthy. I will never go back. I normally like going to Bar Mercurio ordering pasta or pizza but this time the pizza was not good. I had the rappini pizza. It was burnt, hard, dry with very little cheese and no sun dried tomatoes. Did you change the menu for the pizza because before it was light with lots of cheese and very tasty. I am sorry to say but this pizza was worse than pizza pizza. Our service was also poor because we waited almost 45 minutes to get our pizza. One waiter totally ignored us when we brought our concerns. Another informed us there was a delay because they were waiting for us to finished our salad. This is after we told three people that we like to eat our pizza with our salad. It was nice of you to not charge for our pizza because it was missing the tomatoes but my intent was to enjoy a delicious pizza, not to get a poorly made free pizza. I am sorry but our experience was not very good and we will not be coming again. Fresh, tasty meal with good portions; open kitchen, busy and fun bistro ambiance. Worked well for a business lunch and apparently it becomes a white-table cloth dinner and wine place after 5 -- will try it again. I had the specials, sweet potato soup followed by veal scallopini, both totally delicious! My best dining experience in Toronto to date. The food is consistently high quality, without compromise. The menu stick to time honoured tradtional tastes and aromas, yet include new combinations and adaptations. There is a subtle energy to the place without rushing patrons and the service is informed and attentive without being intrusive. I enjoy returning to this cafe for lunch, whether for casual dining with friends and family or for a business meeting. It has the right essential balance that makes this one of the best Italian cafe that I've been to outside of Italy.